Not even torrential rain could stop the Quick-Step Floors rider from making it a poker of wins at his home race. Elia Viviani became the first Italian in 12 years to land four stage victories at a single edition of the Giro d’Italia after another marvelous display of power, intelligence and well-crafted strategy of the Quick-Step Floors team in Iseo, a finish for just the third time in history, after 1973 and 1974. 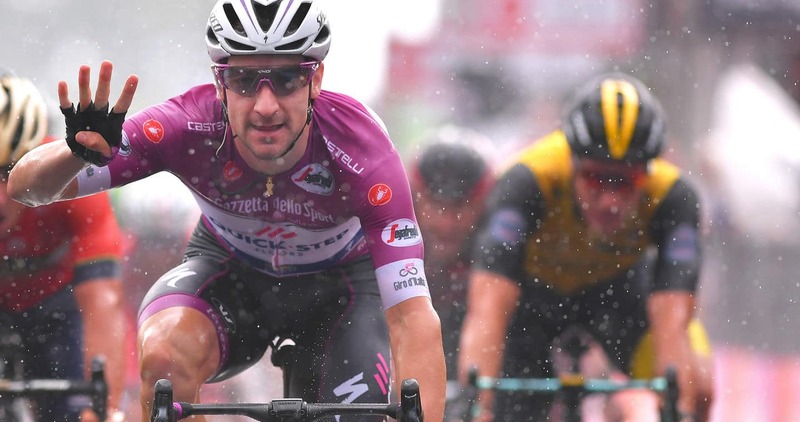 His amazing feat allowed the 29-year-old to further distance the competition in the cyclamen jersey classification, with 58 points separating now Viviani from his closest opponent with one flat stage left on tap. “Saba was amazing today, he kept me out of the headwind until with 200 meters to go and all I had to do from that point was open my sprint after Van Poppel tried to anticipate me. I had good legs, but what really made the difference was the selfless work of my extraordinary teammates. They deserve the credit for this fourth win, which gives me huge joy”, a happy Elia said at the press conference. In what was one of the craziest stages of this edition (Riva del Garda – Iseo, 155 kilometers), just ahead of what should be three excruciating days in the mountains, Quick-Step Floors was attentive from kilometer zero, protecting Elia Viviani on the 10km unclassified climb on the shores of the stunning Lake Garda, where several teams upped the pace in the hope of dropping the maglia ciclamino, infiltrating Maximilian Schachmann in one of the breaks formed midway through the stage and sending Czech Champion Zdenek Stybar to counter a late attack with five kilometers to go. A late acceleration stirred up things a bit, before Quick-Step Floors decided to take command under the flamme rouge arch on the soaking wet roads of Lombardy, where Stybar brilliantly put the hammer down for 600 meters, stretching the field in the pouring rain, before Fabio Sabatini delivered a textbook lead-out for Elia Viviani, who blasted past his rivals and captured his tenth victory of the season. “I was a bit nervous before the stage, because I knew that Bennett was favoured by that climb in the beginning, but the boys kept everything under control. Increasing my lead in the points classification is the cherry on the top, as the cyclamen jersey is an important goal and I hope to keep it until Rome. 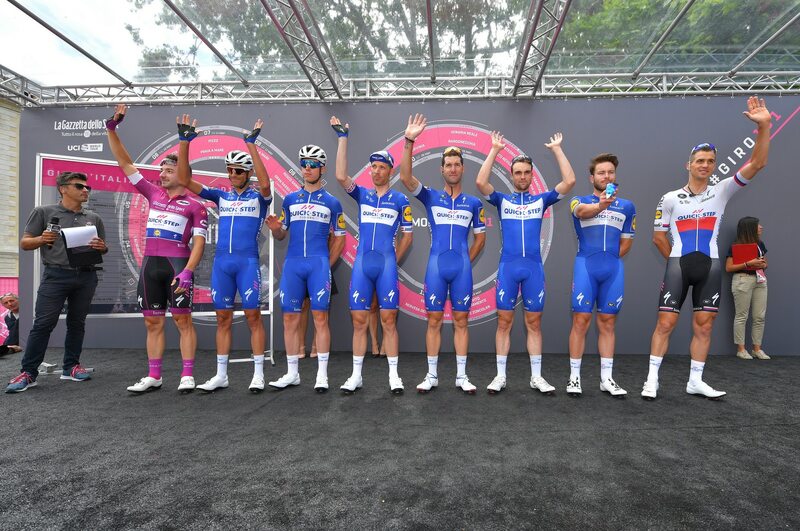 Sunday puts an end to what’s been a very competitive first part of the season for me and I hope to end it on a high note”, said Elia Viviani, the fourth different Quick-Step Floors riders to take minimum four stages in a Grand Tour in the past 12 months.